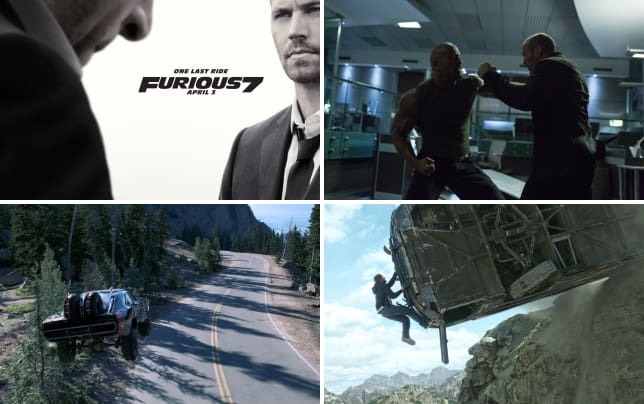 The Furious 7 gang has delivered one more sneak peek to its die-hard fans all over the world (before its April 3 premiere) in the form of an “extended first look." It aired during the premiere of the USA Network’s new show, Dig. We get fantastic glimpses at the heart-pounding action that was all over those last two Furious 7 TV spots, but there’s so much more. In fact, fans should be thrilled that Universal has shown off what appears to be almost the entire scene of something that we promise will make your jaw drop and your heart pound. If anyone wonders how they can top themselves after six films, just watch the below clip! The extended look also reminds us why we adore this film franchise in the first place -- the cast. Vin Diesel always talks on screen about how the gang is more family than anything else. We see that familial bond in this extended look as filmmakers show off the cast including Diesel, Paul Walker, Tyrese Gibson, Chris “Ludacris” Bridges, Michelle Rodriguez and Lucas Black. Of course, we also are excited to see the return of Dwayne Johnson and new to the series Djimon Hounsou, Ronda Rousey, Tony Jaa, Kurt Russell and, of course, Jason Statham. And like a family, they take care of their own. In Furious 7, one Furious member is gunned down in Tokyo and the family is being targeted. They go on the offensive and go after the source, Statham. “The sins of London have followed us home,” Diesel says. Yes, they have. Watch Fast and Furious 6 online and see what exactly he means.